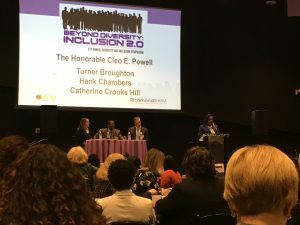 On March 21, 2019, I attended Beyond Diversity: Inclusion 2.0, the Fifth Annual Diversity and Inclusion Symposium, presented by the Richmond Society for Human Resources Management at the Science Museum of Virginia’s Gottwald Center. The conference featured national and local leaders who are doing the hard work of teaching and training about ways employers can achieve their diversity and inclusion goals. First, Johnny C. Taylor, Jr., President/CEO of SHRM, kicked off the conference with a rousing call for HR leaders must demonstrate the great courage needed to do the hard work of creating an inclusive workplace. Taking the lessons of how the law has evolved to prohibit discrimination in the workplace, he shared the hard truths of how D+I initiatives have failed to put the best talent in place to lead this work and underestimated how hard it is to foster and manage diversity in the workplace. He reiterated that the workforce is already becoming more diverse, so it is imperative that employers focus on inclusion when it comes to D+I work. Next, the Honorable Katherine McCary, President of C5 Consulting, focused on the fundamentals of disability law and the need for employers to focus on including individuals with disabilities into their D+I initiatives. She provided strategies and etiquette tips on how to include individuals with disabilities in hiring and retention. In a stirring presentation, Mauricio Velasquez, President of the Diversity Training Group, highlighted the qualities of inclusive change agents. Change agents are necessary to create and maintain an inclusive workplace. He provided suggestions on how to develop the skills of interrupting offensive behavior and micro aggressions. He explained how a company’s culture of trust and core values must be in place before real change can happen. Otherwise, there are likely to be different standards between “in” groups and “out” groups that won’t encourage actual inclusion. Through personal and workplace examples, he identified and demonstrated tools that change agents can use to respond to bias and coach others on how to contribute to an inclusive environment. After lunch, Meg Gibbon and Kezia Charles, Senior Director and Director of Willis Towers Watson, shed light on how implicit bias, even manifested in the smallest way, can create long-lasting, negative impact. They provided a model plan to help bystanders intervene in the middle of harassing or bullying situations: notice the negative impact, evaluate the behavior, recognize your responsibility to respond, act to intervene, and reflect on the efficacy of your action. Through group discussions, they emphasized the need for each person to take ownership of their responsibility to come to the aid of those who are victimized by bias and are creating a non-inclusive environment. Finally, Justice Cleo Powell of the Supreme Court of Virginia moderated a panel on unconscious bias in the courtroom. University of Richmond Law Professor Hank Chambers, and litigators Catherine Hill and Turner Broughton shared their courtroom experiences with implicit bias, both as it impacted their roles as attorneys and their clients. Through compelling real-life examples of cases they litigated and mediated, the panel demonstrated how lawyers anticipate bias that may be present in juries and how judges carefully conduct their courtroom to keep bias in check. In applying these lessons to the world of human resources, the panelists emphasized the need for employers to refrain from making hiring and firing decisions because of bias. Instead, employers can take a lesson from lawyers by ensuring they make evidence-based decisions that overcome conscious and unconscious bias. They emphasized the importance of training regarding implicit bias and the importance of dialogue and ongoing education on the subject. Once again, Richmond SHRM gave its attendees an invigorating day of learning about the need to focus on inclusion. As an employment lawyer, I see common traits between those who work to foster inclusion and those who are good managers and who help companies manage risk with sound employment decisions. Both value differences and abide by a company’s code of conduct. Both lead by example. Both are self aware and work to overcome their bias when making decisions. Both know how to have hard conversations. Both focus on solutions and embrace conflict as an opportunity to learn and improve. To do the work of diversity and inclusion, therefore, is to do the work of a good manager. But it’s really hard work that employers should support with training and from the top-down. Contact Sands Anderson’s Labor & Employment Law Team to learn more about the training and legal advice that we can provide to help advance your diversity and inclusion initiatives in your workplace.